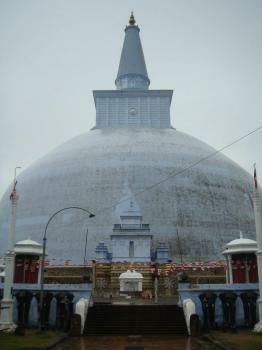 The Sacred City of Anuradhapura was the first capital of Sri Lanka. Already in 380 BC it became the Singhalese capital. 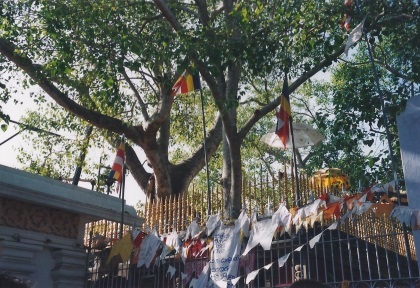 One of the most famous (and eldest) monuments at the site is the sacred bo tree near the centre. It was grown from a cutting from the tree in India where Buddha achieved enlightenment, and brought here in the 3rd century BC by Sanghamitta, the founder of an order of Buddhist nuns. The old capital flourished for 1,300 years, until it was abandoned after an invasion in 993. Nearby Polonnaruva, said to be a safer place, became the new capital. The impressive remains of the site were discovered in the early 19th century, hidden away in thick jungle for a long time. 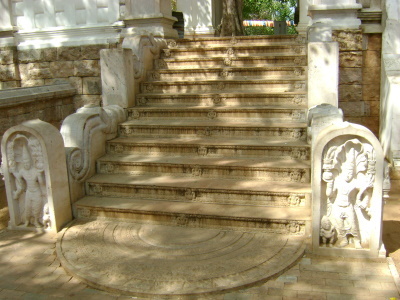 The palaces, monasteries and monuments are since then in restoration. The ancient, magic bo tree welcomes you as you enter the main complex. Its age (2300 years?!) is something to dwell on, although we were not really sure which one of the two prominent trees was the legendary one. The rest of the monuments are spread out over a large area. Because of that, and because they are so old, Anuradhapura is not easy to grasp as a day trip (as I did). As a cultural worker, hunting for World Heritage Sites has gone beyond just seeing sites. Rather, it has become more of experiencing them. Hence, in the Anuradhapura vs Polonnaruwa debate, clearly, I would have to give it to the former. The first capital of Sri Lanka remains very much alive today, attracting more devoted pilgrims than actual tourists. While most of the key monuments here are dagobas (local term for stupa), and the variety of architecture is not as diverse as that of Polonnaruwa's, there is a great amount of history in each of them that have been made more special by the reverence that the people continuously attach to them up to these days. In fact, the age of the original monuments here would rival those Buddhist monuments in India, which was really surprising to find out. Not only were they some of the tallest monuments ever seen in the ancient world, but they also stand as pillars as to why Anuradhapura is titled as a "Sacred City", and not just an "Ancient City" as in the case of Polonnaruwa and even Sigiriya. There are two other sacred cities in Sri Lanka which we were also fortunate to see: the Sacred City of Kandy -- also a WHS -- and the Sacred City of Tissamaharama. In Anuradhapura, the Sri Jaya Mahabodhi tree is the most sacred element of the city and it sits right at the center. From there, the glaringly white Ruwanwelisaya dagoba is a short walk away, passing by the Mahalohapaya ruins. Currently, it stands as the tallest dagoba in the country after the finial of the more massive, red-brick Jetavana dagoba broke off. To see the rest, it was, however, wise to hire a tuk-tuk. 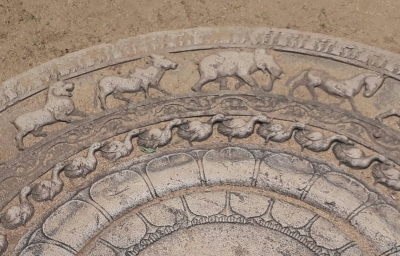 As a place mostly composed of dagobas, Anuradhapura is perhaps the best place to study this architectural style -- from the ruined remains of the Dakhina dagoba to the carefully restored Mirisawetiya dagoba nearby, from the vatadage-styled Thuparamaya (the oldest and one of the smallest) to the ongoing construction of the modern Victory stupa, which will be the tallest once it will be finished. We also managed to visit some of the farthest sites such as the Isurumuniya vihara, which requires a separate entrance fee. This vihara is considered as the oldest monastery in the city and we enjoyed talking to one of the resident monks there about the history of the site. He even kindly tied pirith nulas around our wrists, and I was able to record on video the chanting performed along with it. Half a mile away is the Vessagiri, a rock shelter for monks that features Brahmi inscriptions and faint traces of ancient frescoes that will only make sense with a guide's help. A pleasant bonus was when our driver also took us inside the ancient citadel to check a few ruins including that of the Dalada Maligawa, the former shrine housing the sacred tooth relic. That time, there was a local herbalist who was gathering various plants for his concoctions. The photo I took of him while doing his thing is probably one of my favorite shots. It took us a little less than 6 hours to see most of the sites included in this World Heritage Site, and I cannot say I was not impressed. From Dambulla, which is a good base, Anuradhapura is 1.5 hours away via bus and is totally doable as a day trip. Unfortunately I didn't get the chance to see as much of Anuradhapura as I would've liked. I only had a few hours there as I was passing through and decided that it wasn't good value to but the entrance ticket. It cost US$25 and I thought it was pretty bad value. I do regret my decision now, for the record! Regardless, there are quite a few sites you can see from the road and you won't need a ticket for. There are also a few smaller sites within the area that just cost a dollar or two to go into, so you can get a taste of the city without buying the full ticket. 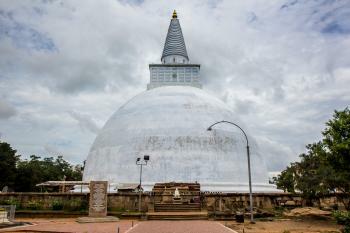 Anuradhapura is nice, because of its numerous and impressive pagodas. On the other hand it is not an easy site to visit, as the points of interest are far from each other. It's mostly pagodas you will see, so there is less diversity than in Polonnaruwa. For me this site was no match to Sigiriya or Polonnaruwa. I have visited Anuradhapura almost six times now and each time its not that hard to find a new place that I haven't visited before. If you are visiting Anuradhapura then you should plan it before hand. If you are a tourists a tour guide is highly recommended. If you are a tourist visiting all the pagodas might make you boring because you don't know the historical facts attached to them. If you are there for a one day visit I can suggest the following. When it comes to tourists my experience is they are mostly pleased at visiting Isurumuniya, because of the beautiful stone carvings. Anuradhapura, the city of king was the capital city of Sinhalese for 1,400 years with long history of royals, wars, and religious to be one of the most important ancient cities in this region and the cradle of Buddhism outside India. Everything of Anuradhapura is Buddhism and the center of the city is the sacred city. The word “city” in this term is quite similar with Vatican City or Beijing’s Forbidden City which are the city inside the city. The sacred city was the large complex of ancient monasteries with thousands of Buddhist monks when the city was in its zenith. The centre of the sacred city is Sri Maha Bodhi, the holy tree, the symbol of local Buddhism, was bought from India 2,300 years ago, and is considered to be one of the oldest living trees in this world. 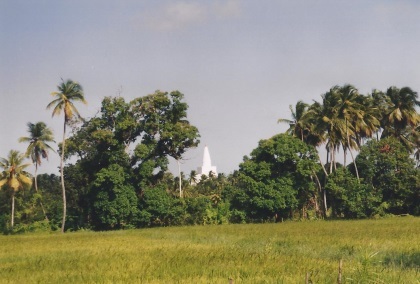 Not only the holy tree, Anuradhapura has many big stupas, the most famous of all maybe Thuparama and Ruvanvelisaya. Thuparama is regarded as the oldest stupa in the world and is the model of Buddhist stupa in many parts of Asia. The gigantic white stupa of Ruvanvelisaya is just breathtaking with its size and hundreds of worshippers. The city is also famous for its art, the guard stone and moon stone at Mahasena and Ratna Palaces are the must see for their amazing mastery craving qualities. Visiting Anuradhapura was quite a unique experience; I had to walk 1 km on bare foot in Sri Maha Bodhi and Ruvanvelisaya areas passed many security checking points with hundreds of local pilgrims. These places should be spiritual and peaceful, but the thing I saw were soldiers with guns in every corners of the area making a war zone liked feelings. There were also many rules of photography and dress code. But I could not compliant since terrorists had attacked the holy tree and killed many people, so having these soldiers maybe the best thing for this sacred city. All in all, Anuradhapura is a nice place to visit, but in my opinion these place is not a must since most of the places are stupas which are looked quite the same for non-expert who is unable to separate the differences of bubble, bell and rice heap styles; it is quite hard to appreciate unless you are in deep interest of Sri Lankan history or local Buddhism, the nearby Polonnaruwa maybe the better place for normal casual tourists and typical Kodak moments. A fascinating place to visit, particularly the enormous stupas. Whilst the cultural triangle ticket is expensive, it does give access to almost all of the main sites. Famous Love Stories: Story of Prince Saliya and his lowcast lover, Asokamala.